Sleep knits up the ravelled sleave of care��.it is the death of each day’s life, sore labour’s bath, balm of hurt minds, great nature’s second course and chief nourisher in life’s feast. So said the Bard of Avon, William Shakespeare, in ‘Macbeth’ on the important role played by sleep. Centuries later, a Sleep Medicine Specialist from the prestigious Mayo Clinic in America brings to Sri Lanka, with scientific evidence, the same message.�“Sleep is a requisite,” stresses Dr. Suresh Kotagal from the Mayo Clinic in Rochester, Minnesota, adding that we spend one-third of our lives sleeping. 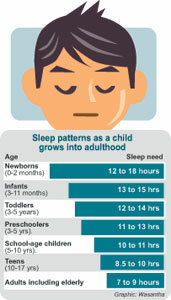 But many people including children have troubled sleeping patterns. The prevalence of sleep disorders in children is “fairly high” about 20-30%, points out this Professor of Neurology and Consultant in Paediatric Neurology and Sleep Medicine, underscoring the fact that the quality of a person’s sleep is linked to the quality of life during the day. Consultant Paediatric Neurologist Dr. Anuruddha Padeniya deals with the question: What is sleep? In an exclusive interview with MediScene, Dr. Kotagal who was in Sri Lanka recently at the launch of Sleep Neurology Services at the Lady Ridgeway Hospital for Children picks out several disorders, including the most common which is Obstructive Sleep Apnoea. Obstructive Sleep Apnoea – Children affected by this condition which is due to an obstruction in the airway, stop breathing for a short time, lasting from about 10 seconds to a minute, while sleeping. Such episodes could occur many times during the night. In different age groups the cause of the apnoea differs. Lymphoid hyperplasia and tonsil enlargement may be the cause in children in the 2-6 year age group and obesity in adolescents. Boys are more prone than girls. Sleepwalking – Common among 8-12 year-olds, the child may wake up and wander about without remembering doing so. Lasting a few minutes, sleepwalking takes place about one or two hours after the child falls asleep. Some of the actions during this time would include getting out of bed and walking around with open but dazed eyes; sitting up in bed and repeating movements such as rubbing the eyes or tugging at his night clothes; not responding when spoken to; sleep talking; and not responding to attempts to wake him up. Sleepwalking may be hereditary or caused by fatigue or lack of sleep, interrupted sleep or inefficient sleep due to disorders like sleep apnoea, illness including fever, stress or anxiety, some medications, going to bed with a full bladder and being in a noisy or not-usual sleep environment. Nightmares (bad dreams) & sleep terrors – Often linked to the development of fears to real threats, nightmares occur during the second half of sleep. When having a nightmare, the child will moan, move about on the bed and sometimes get a leg-twitch. In sleep terrors, the child may wake up screaming or fearful, kicking around or getting out of bed and attempting to run away but return to sleep within a few minutes without any memory of such an episode. Affecting mostly children between 4 to 8 years, ‘terrors’ are more dramatic than nightmares and occur two-to three hours after sleep. Nocturnal seizures or fits – These seizures can grip the child just as he goes to sleep, while sleeping or just after waking up in the morning. They can occur even if the child has never had a fit during the day. In the Sri Lankan context, some sleep disorders may be linked to underlying anxiety or Post-Traumatic Stress Disorder (PTSD), says Dr. Kotagal, advising parents to watch out for anxiety in daytime which could manifest itself as nail-biting, inattentiveness or being physically over-active. PTSD, MediScene understands, could come about after a traumatic stressful event that the child has faced, where he feels a loss of control over what is happening to him. 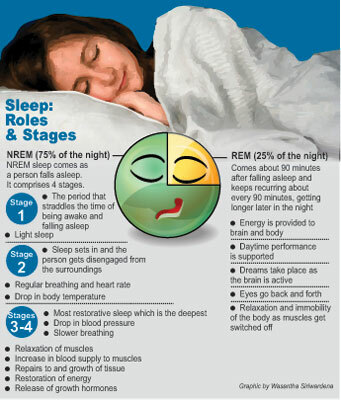 On how to deal with these sleep disorders, Dr. Padeniya says that as frequent nightmares may be due to a medication or disease, it would be advisable to seek medical attention. To prevent night terrors, the child should be safeguarded from sleep loss and excessive stressors, he should be made comfortable. If the terrors are severe and persistent, medical advice should be sought. In both the cases of sleepwalking and sleep terrors, the parents should ensure that the child does not injure himself by falling or knocking against dangerous objects, says Dr. Padeniya, pointing out that an alarm or bell may be helpful in alerting the parents when the child begins to sleepwalk. “Don’t wake him but gently redirect him back to bed,” he adds. Teenagers be aware – you need at least 8� – 9 hours of sleep daily for optimum alertness during the day.�Quoting studies, Dr. Kotagal says that teenagers need “good sleep” to recalibrate otherwise they become the victims of impaired daytime attention, mood swings and increased propensity to accidents as sleepiness slows down reaction time. Ongoing studies also indicate that short sleeping hours may pose a risk for obesity as tired teenagers may go in for quick-fixes such as microwave and fatty foods instead of a healthy diet which includes green leafy vegetables, according to him.�Dr. Kotagal urges parents not to shut their eyes to the sleeping behaviour of teenagers who stay awake until the wee hours of the morning and then have to get up early for school. “Your teenager’s mobile phone should be on the kitchen counter and not in his bedroom while electronic items such as TVs and computers should also be out of the bedroom,” he says.�There should be a sensible balance in the use of electronic items and teenagers should not be sacrificing sleep to watch TV, play computer games or be texting friends in the middle of the night, is Dr. Kotagal’s clear message.